Tuesday Cloudy. High chance of showers in the southwest, medium chance elsewhere. The chance of a thunderstorm. Winds E/SE 15 to 20 km/h. Wednesday Cloudy. 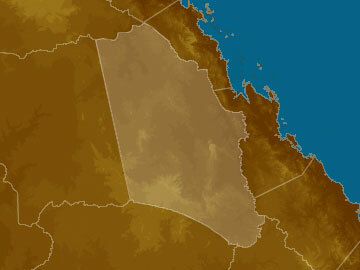 High chance of showers and rain areas about the Carnarvon Ranges, medium chance of showers elsewhere. The chance of a thunderstorm. Heavy falls possible about the Carnarvon Ranges. Light winds becoming SE 15 to 25 km/h in the morning. Thursday Partly cloudy. Slight chance of a shower in the northwest, most likely in the morning and afternoon. Near zero chance of rain elsewhere. Winds E/SE 15 to 25 km/h becoming light during the evening. Friday Mostly sunny. Slight chance of a shower in the northwest, near zero chance elsewhere. Light winds becoming E/SE 15 to 20 km/h during the morning then becoming light during the afternoon.